On Tuesday morning, the Federal Reserve woke up and saw the stock market was going in a strange direction it was not supposed to be going; down. Action was taken immediately, beginning with San Francisco Fed President John Williams who said, "if we get a sustained, disinflationary forecast.....then I think moving back to additional asset purchases in a situation like that should be something we seriously consider." The stock market regained its footing on Tuesday and by Thursday afternoon it was time for another Fed member to turbocharge the rally. St. Louis Fed President James Bullard stepped up and said, "we have to make sure that inflation expectations remain near our target. And for that reason, I think a reasonable response by the Fed in this situation would be to.....pause on the taper at this juncture, and wait until we see how the data shakes out in December." Only two weeks ago there was an across the board consensus coming from the Federal Reserve that not only should QE be stopped, but the Fed should immediately begin raising rates in 2015. The Fed's dual mandate is to promote low unemployment combined with stable inflation (discussing the absurdity of this dual mandate is beyond the scope of this discussion). The number of people applying for unemployment in the U.S. this week fell to a 14 year low. Combine that with a falling cost of living due to the energy decline and the Fed's dual mandate looks right on track. However, there was one sector of the U.S. economy that experienced severe deflation this week: the U.S. stock market. The Fed's immediate reaction to talk up the market with unemployment improving and inflation falling reveals the Fed's true mandate: promoting a higher S&P 500 close at the end of every trading week. The most interesting part of this sham is when the real sell-off arrives market participants will see that the Fed is actually powerless to stop it. There is one last option, the "nuclear" option, that can be employed during a stock market collapse; large scale purchases of U.S. stocks through QE (printing money to buy stocks). This is the weapon of last resort, and I expect it to be used in the latter stages of the coming crisis in the massively overpriced U.S. markets. Japan is already employing this strategy with their central bank currently in the market every month making stock purchases (alongside their enormous bond buying program). So how will this all play out and under what timeline? I have absolutely no idea. If anyone tells you they do, politely excuse yourself from the conversation and walk away. We are so far away from charted territory and so far away from anything that remotely resembles a real market it is beyond impossible to try and figure out how the market will react in the short term to every central bank intervention. In the long term, what we do know with assurance is that every central bank intervention fundamentally weakens the general economy and financials markets. It is a poisonous intravenous fluid continuously injected into the arm of the financial system. It is fairly simple to understand that a debt problem cannot be solved with more debt and printed money; it will only create a larger and delayed crisis in the future. Yet, after years and years of a market rally combined with central bank board members holding fancy economics degrees telling the world they have everything 100% under control, people believe the wizard is real and there is no reality waiting behind the curtain. In the end there will be chaos. You'll hear from the mainstream media over the next few weeks how the deficit in the United States has fallen to "only" $483 billion in the 2014 fiscal year. While a deficit of that size seemed unimaginable back in 2007, it appears on the surface to be a massive improvement from the trillion dollar plus deficits than have been running since 2008. David Stockman, the former Director of the Office of Management and Budget under Ronald Reagan from 1981 to 1985, penned an excellent article this morning on the magic of government accounting. As seen in the chart below, the amount borrowed (the real debt that must be payed back by American taxpayers in the future) was actually $1.086 trillion in 2014. The deficit reported was largely wiped away due to accounting sleight of hand during the debt ceiling debate and movement of the debt into "other" off-budget categories. 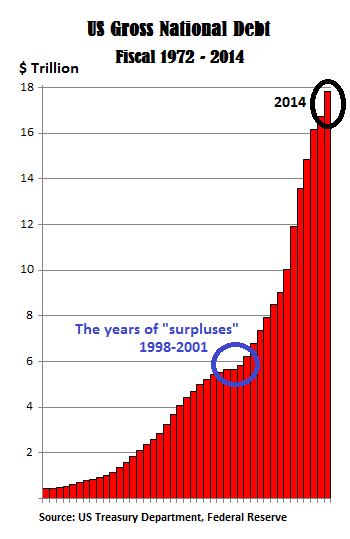 For the complete breakdown see Washington Accounting Magic: US Deficit $483 Billion, New Borrowing $1.1 Trillion. Better Buy: German Government Bonds This Morning Or Cisco In 2000? While I have documented the madness surrounding the pricing of Japanese bonds relentlessly over the past few years, it appears that instead of Japanese bonds returning to more rational price levels, other countries are joining Japan in the realm of insanity. The yields of German government bonds now mirror what is occurring in Japan only on the shorter duration they have moved negative. If you want to lend your hard earned money to the German government for 4 years (or less), you must pay them to hold your money. If you would like to lend to them for 10 years they will provide you with a 0.71% interest rate annually. Germany has a strong export oriented economy with low unemployment, and its government debt to GDP ratio is less than 80%. In comparison to Japan's ridiculous 250% government debt to GDP their government balance sheet looks immaculate. However, when you add in public and financial debts to the mix, Germany's debt to GDP ratio rises to a less manageable 270% of GDP. As seen in the graph below, this number looks great when compared to the industrial-country average, but does that mean you should invest in German government bonds? The best way to think of this is to use an analogy from a previous mania because we are currently at the final stages of a government debt super bubble. 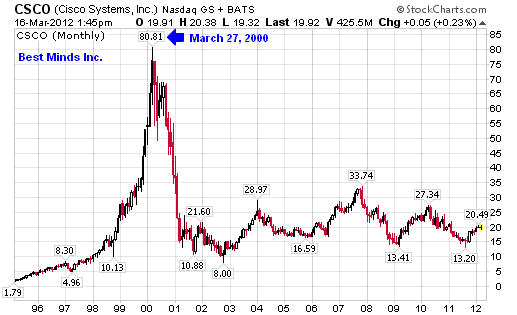 If you were an investor back in early 2000 someone might approach you to discuss the opportunity in purchasing Cisco stock. They explain to you how it is far safer stock to own than a company like Pets.com because Cisco is a real business that is making real profits (just as someone might argue the safety of German debt vs. Japanese debt today). The problem is not the business, but the price. Entering the year 2000, Cisco had a price to earnings ratio of 109 using extremely optimistic earnings projections (the historical average for P/E ratios is around 15 using Wall Street's optimist forward earnings). Although Cisco was a strong business, you were paying beyond bubble prices for the stock. This same scenario is occurring in government bonds today. Germany's government is going to pay it's bills over the next ten years, but at a return of 0.71% the price of Germany's bonds can still collapse in the years ahead. If yields were to move up to a more rational 3.0% level, investors would lose a tremendous amount of principle (bond prices fall as bond rates rise). 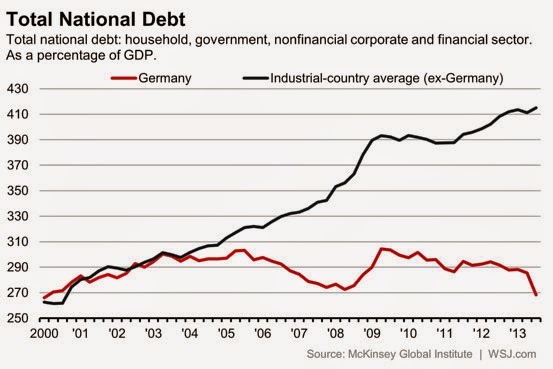 Germany looks better than Japan on a relative basis (just as Cisco looked better than Pets.com back in 2000), but does that mean you should currently own the debt of either country? What happened to the investors making the buying decision back in 2000? Those that went with Pets.com lost everything (the stock went to zero), while those that stayed with Cisco only lost 86%. 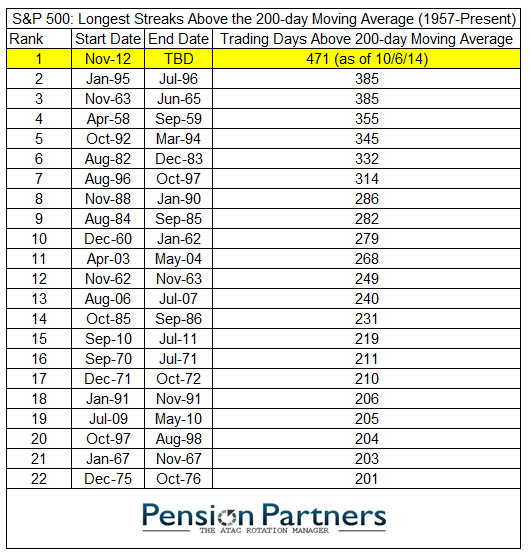 The S&P 500 has broken below its 200 day moving average for the first time in 98 weeks. This incredible run puts it at the top of the historical list. After an almost two year never ending party in the U.S. stock market, participants calmly believe no hang over is necessary. I am in the camp that believes something far more wicked is waiting. “Abrupt market weakness is generally the result of low risk premiums being pressed higher. There need not be any collapse in earnings for a deep market decline to occur. The stock market dropped by half in 1973-74 even while S&P 500 earnings grew by over 50%. The 1987 crash was associated with no loss in earnings. Fundamentals don't have to change overnight. There is in fact zero correlation between year-over-year changes in earnings and year-over-year changes in the S&P 500. Rather, low and expanding risk premiums are at the root of nearly every abrupt market loss. This is much like what happens when a substance goes through a ‘phase transition,’ for example, from a gas to a liquid or vice versa. Portions of the material begin to act distinctly, as if the particles are choosing between the two phases, and as the transition approaches its ‘critical point,’ you start to observe larger clusters as one phase takes precedence and the particles that have ‘made a choice’ affect their neighbors." I've spent 18 months laying out the case for why U.S. stocks were one of the most overpriced asset classes on the planet and why they were due for a massive correction. 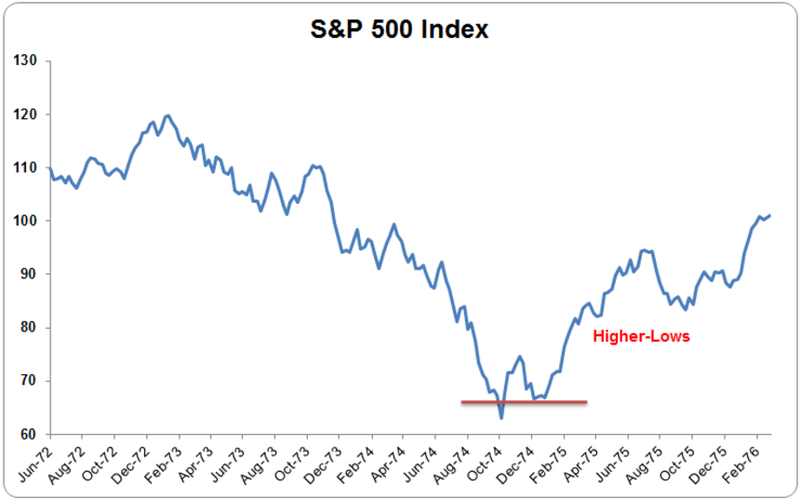 We've now begun the process of correcting downward in all the major indexes with many individual stocks down 20% or more. Is this the big correction that finally removes the excess that has built up over the last three years? 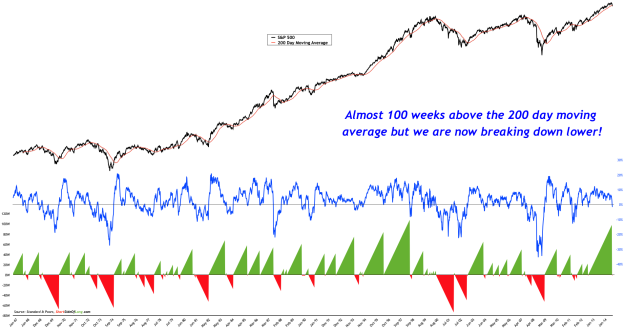 The market has experienced many 5% ish corrections over the past few years only to wipe away the declines and immediately go on to new all time highs. That could easily happen again this time with markets finding their footing and blasting off further into the stratosphere of the absurd. Trying to top tic the market should not be important to you. Whether the final top is S&P 2000 or S&P 5000, you are simply playing Russian roulette by adding money to U.S. stocks at these price levels. You can look real cool playing for a while, but like someone with a "magic roll" at a craps table, gravity always finds of way of returning to the world. Now is actually the easy time in terms of investing because you're not really doing anything. All you have to do is stay off the train tracks and out of the way of the oncoming train. (As a quick side note, while I have been mostly adding cash to my portfolio I have been nibbling at assets such as silver, corn, wheat and uranium stocks over the past year which I have discussed on the site). However, while investing today is easy, psychologically, this is one of the most difficult times. Almost everyone you know is most likely throwing a party on the train tracks and waving you over to join. If you have the ability to psychologically avoid the oncoming train, this is the time to begin preparing your strategy for what you would like to purchase after it arrives. Put a plan in place today for assets that you would like to purchase when they go on sale in the future. For me personally, I plan on investing heavily in the commercial real estate sector when the froth is removed from that market. I've spent the last few years managing commercial properties and working for a large commercial real estate finance company preparing myself to understand where value exists and manage the buildings after they have been purchased. If properties fall by 40% (I believe many will fall more), then I have a plan in place for how I will begin to accumulate assets, where I will accumulate them and why. I fully expect to begin buying before the market reaches a bottom. Believing that I have the ability to bottom tic any asset class is as naive as believing you have the ability to determine an exact top. The goal is to determine ranges of undervaluation and overvaluation. We are certainly in the latter today. If you are interested in purchasing U.S. stocks, perhaps for the income stream they can provide through dividends, then think about what would happen if the P/E ratio on the broad U.S. indexes were to fall from the bubble levels of 26 ish today (Shiller CAPE) down to a more healthy range of about 13 (I believe they will fall more). 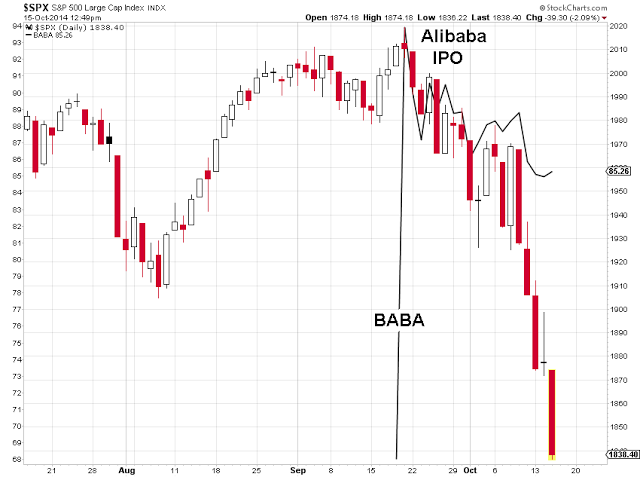 Do you know what stocks you would purchase if there was a market decline of 50%? Do you know why you would purchase them? Perhaps you would like to purchase government bonds of various countries around the world. Do you know what currency and interest rate level you would like to purchase the bonds? Do you have a plan in place to make the purchases if there was a panic sell off in a specific bond market or currency? Most importantly, would you be able to psychologically enter a market after a major decline and begin accumulating assets on sale? After the train has arrived and everyone you know has seen their portfolios annihilated, if you go back up on to the tracks you will find a very lonely place. People will be shouting at you to get off as quickly as possible and move into safety. Maybe this is the beginning of the real crash. More than likely, it's not. The U.S. stock markets are about 5% ish less dangerous than they were a few weeks ago. Unfortunately, the still have a long, long way to go before they reach a level that can be described as safe. Make a shopping list today and have a plan for when markets going on sale. Then welcome it with open arms when the crash finally arrives. For more see: What If The Stock Market Fell & It Did Not Recover? 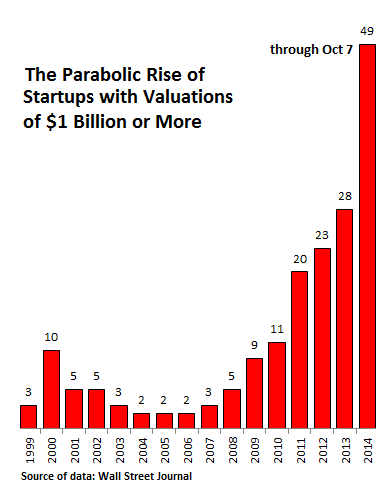 I came across the chart below this week, which shows the new normal for startup valuations (remember when 2000 was considered a "manic" time?). 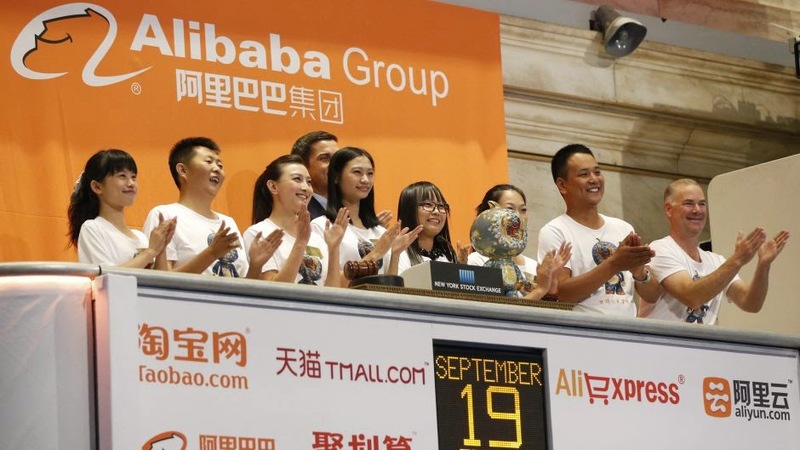 One can argue in the last 18 months an incredible number of new companies have been created that will change the business world as we know it in the decades ahead with profit streams backing these astronomical valuations.......or one can argue that the market is just a bit frothy right now. I discussed my thoughts on this topic in Facebook's Valuation Crosses $200 Billion: What Is It Really Worth? Please remember to take my skepticism with a grain of salt. I'm an old geezer that probably just doesn't understand what those kids are doing out there in California.